Good marketing means getting your message, services and products in front of your potential clients for as long as possible, and increasing the number of people who see your materials to include as large a group as possible. The solar illuminated brochure box is a great way to do this. This great product is ideal for real estate agents, take menus at restaurants, and any other business that leaves information outside, at night, to be taken by passersby. By illuminating this material all night, you greatly increase its attractiveness, and the number of people who will see, and ultimately take the material. Lighting things up can essentially double the amount of exposure, since potential home buyers can notice a property even after dark. 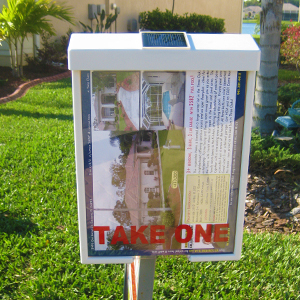 That means that the small investment of a solar brochure box can really make a big difference when it comes to drawing attention to the property and getting it off the market even faster. And these are not the only benefits associated with choosing solar lighting such as a solar illuminated brochure box for all of your Real Estate lighting needs. Solar Energy is clean and renewable, so it will not harm the environment and does not emit harmful CO2 or deplete natural resources. Solar energy is also free to use, so solar energy products such as solar lights carry zero operating costs. Interested in learning more? Check out our Solar Brochure Boxes here.